A warm Highland welcome to The Grog & Gruel. Conveniently located half way along Fort William’s pedestrianised High Street, The Grog & Gruel is a Traditional Alehouse and Restaurant with a warm and friendly atmosphere and a character all of its own. 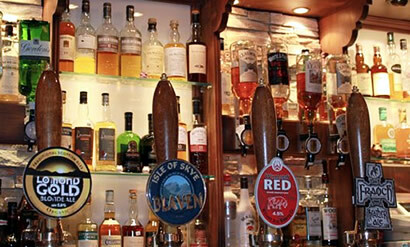 Set half way along the High Street in Fort William, in the Highlands of Scotland and in the shadow of nearby Ben Nevis, our pub and restaurant provide a warm and friendly atmosphere where you will find a range of real ales and malt whiskies and a good place to eat. During the day, call in for a bite to eat in the Alehouse, or simply a cup of tea or a freshly brewed coffee, to rest your legs from shopping on the High Street. Or in the evenings, dine in our first floor restaurant. On busy evenings, the atmosphere of a traditional pub comes into its own, as travellers tell tales of their days out exploring the magnificent West Highlands, and beer enthusiasts talk of the delights of the latest local brew. Families and four-legged-friends are welcome. Free wi-fi is always available. Ask anyone who knows us and they’ll tell you the same thing. Maybe its our undying passion for serving Scottish ales, or local malt whisky, Maybe its our food, cooked fresh to order from an imaginative and varied menu. Since 1994, we’ve been doing what we do best. We're 'a little different' from your average pub & restaurant and so is our food. You can choose to eat from our imaginative Alehouse or Restaurant menus. Your chance to buy one of our highly fashionable, incredibly priced, highly prized Grog & Gruel t-shirt, plus a few other tasteful and very reasonably priced souvenirs. The great atmosphere and the lyrical banter of the staff should be entertainment enough, but occasionally we do take it up a notch and provide some live music for your listening pleasure. The clue is in the name, although we serve much more than ales these days. We've been at the forefront of the rise of Scottish craft beers. You'll find a huge selection of malt whisky along with dozens of Scottish distilled gins. Signup to our mailing list to receive news and special offers.